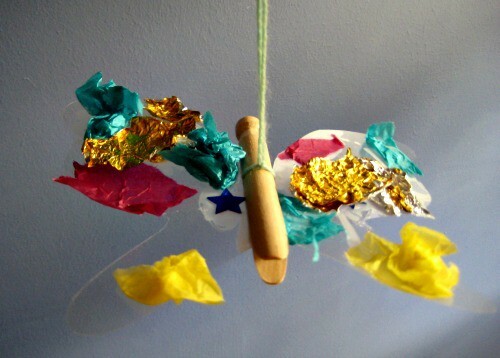 Here’s a easy to make, ever so pretty butterfly mobile craft. 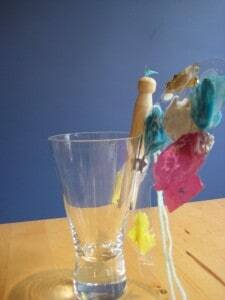 We had some wooden clothes pegs left over from making our pegdolls and Little wanted to make a butterfly. Here’s how we made it…. 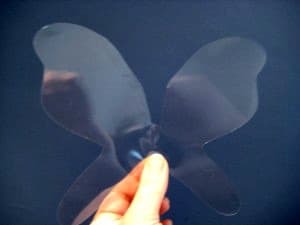 We used a sheet of clear plastic to cut our a butterfly shape – but card or paper would work just as well. L was in charge of customising the butterfly, with liberal amounts of glue and bits and bobs from our making box. We talked about symmertry and L had a good try at getting her butterfly to match. 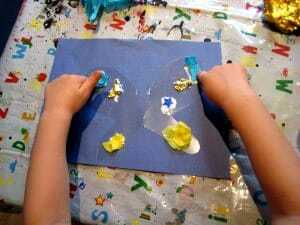 We put lots more glue down the centre of the butterly and inserted the wings into the peg. We also tied a length of string around the peg. Sitting the butterfly on the side of a glass helped press the wings in place while the glue dried. We twisted a pipe-cleaner around to make the antennae, and drew on a face. 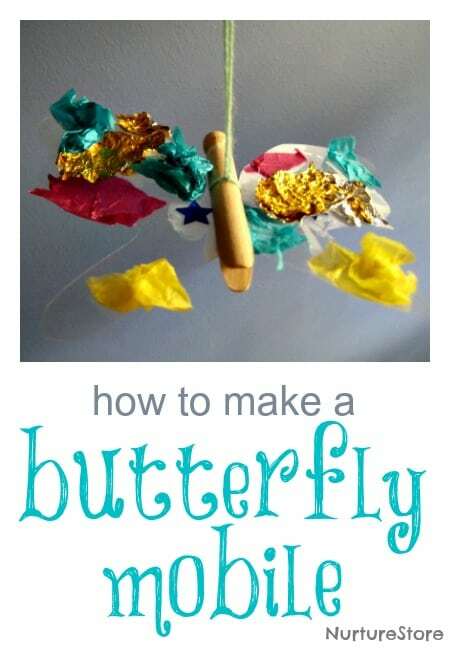 Once all the glue is dry you can hang your butterfly up and watch as the breeze makes it flutter around. They look great :-)) They’d work well with funky foam too. They are lovely, we are going to make some this week- thankyou! So cute! I’ve seen something similar with accordian-folded tissue paper. https://www.facebook.com/theworldofEricCarle shared this great post!